Reflection Key is an almost new, upscale community that is located in the heart of the best of everything Fort Myers has to offer! Bell Tower shopping/restaurants/cinemas, Barbara Mann performing arts hall, beaches and airport convenient close and beautiful Lakes Park is adjacent. PRICE REDUCTIONS MAKE THIS A GREAT BUY! Interior Features A very open, spacious 3 bedroom plan is at ground level for convenience--no stairs! Lots of tile, lovely kitchen with solid surface counters, upgraded appliances, nice breakfast room overlooking the lake. Enjoy the Florida weather from the lanai facing a lake with fountain behind and the pool/clubhouse a few yards away. Exterior Features Two car garage for cars, fishing gear, bikes. 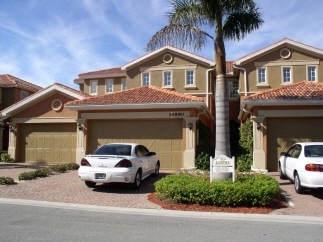 Attractive tile roofs, paver driveways, lush landscaping and gated entry for security, peace of mind. Ft. Myers' jewel--Lakes Park--is adjacent with miles of walking, biking paths, nice playgrounds for the grandkids, bird watching & fishing. Additional Features and Amenities Enjoy the lovely pool and spa after a round of tennis, workout in the fitness room, or a game of billiards in the friendly colubhouse. Yes, a couple of small pets are welcome here.